The montage of images above is made up of the numerous community and church welcome signs you will see when visiting any of our congregations in Childers, Biggenden or Woodgate. We certainly hope you feel surrounded by a warm welcome and a comforting atmosphere if you join us for worship or any of our other events. To be a growing, vibrant congregation which is a power for good in the community. This statement has been incorporated into a new logo and motto, seen at right (with further explanations below*). Information on our church services, location maps + other details can be found by using the menu links down the left side of this page. witnessing in faith; working for justice. * Our new logo and motto to fit the Vision Statement worked on previously were agreed to at an Annual Meeting of the congregations. The Biggenden folk hosted the others for this Combined Worship Service and Annual Meeting. This was held on Sunday, June 19th, 2011 – the Sunday closest to the UCA Anniversary that year. The Service was themed around Trinity Sunday and the message of the day was ‘Three + One’. 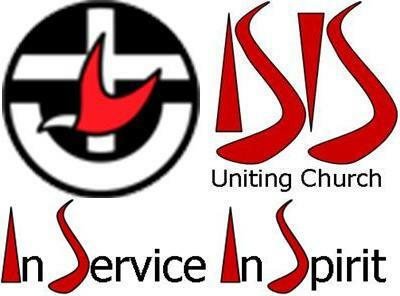 This was a reference to the theology of the Trinity but also alluded to other things including the original three denominations that joined together to form the Uniting Church back in 1977; and the fact that the Isis Uniting Church has three congregations that work together. After worship, those present were treated to a feast of food, fun and fellowship, including sharing in a special UCA Anniversary cake, before joining together for a short but important annual meeting. One of the issues decided upon was this new logo. Rev Peter Taubner, who designed it, said that the inspiration for the motto came from many of the signs seen around the district which promote such things as ‘discover our spirit’, ‘heritage spirit’, ‘coastal spirit’ etc and on such a day as Trinity Sunday, it was special to be launching and adopting this new focus for our tasks of ministry in the community. Using the letters that make up a region that the congregations are a part of, Isis, it is meant to symbolise a couple of the local landmarks that make up the region – a river and highway – as well as referencing the previous shire name. 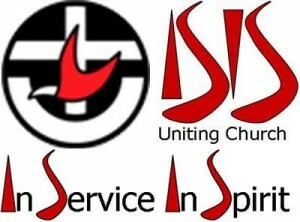 The four word statement is also a brief type of ‘mission statement’ for the Isis UC congregations as they endeavour to serve God, their community and each other and be guided by the Holy Spirit while doing so. The colours are the same as the UCA symbol and the stylised letters are also seen as being reminiscent of both the local landmarks and the fire of the Holy Spirit. Thanks for stopping by our website. It’s an ongoing work but we hope you like it. Let us know if there’s anything else you would like to see. Any comments or feedback can be sent via the email link on the Ministers Details page.